This book highlights the strategic deployment of a straight identity by an LGBT organization. 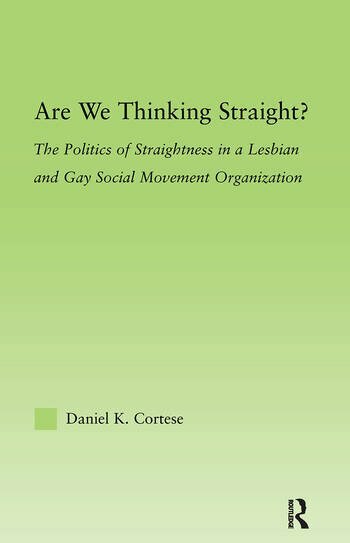 Cortese explores the ways in which activists strategically use a "straight" identity as a social movement tool in order to successfully achieve the movement objectives. Daniel K. Cortese is an Assistant Professor at Governors State University, where he conducts research on the social psychological and sociological processes of identity construction, and how organizations strategically shape collective identities through culture. As a postdoctoral scholar at the University of California San Francisco’s Center for Tobacco Control Research and Education, he analyzed thousands of previously secret tobacco industry documents and tobacco industry-produced lifestyle magazines to detail the tobacco industry’s strategic use of identity in their marketing strategies to target young adults. Dr. Cortese’s research is published in Social Science & Medicine, Journal of Adolescent Health, and Men & Masculinities.